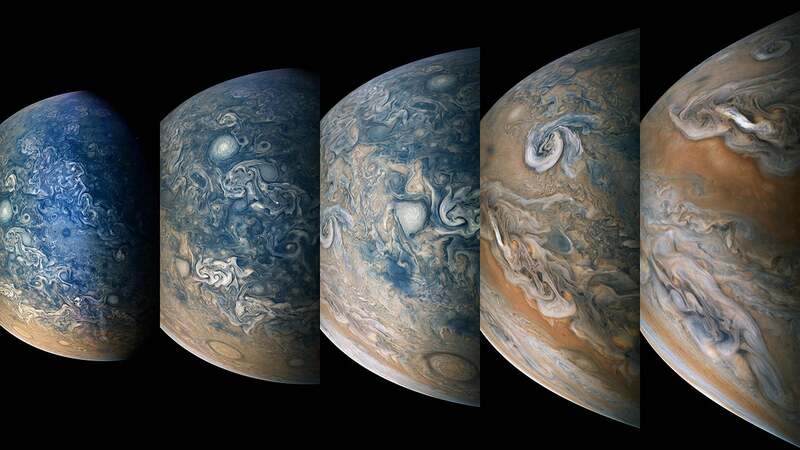 NASA's Juno spacecraft has sent back impressive photos of giant storms in the northern hemisphere of Jupiter made by JunoCam on July 16, 2018. The pictures show the planet's Little Red Spot and another high-pressure star. NASA's Juno spacecraft has returned impressive photos of massive storms in Jupiter's northern hemisphere. 7 minutes, from 12:54 to 01:11 EDT on July 16, 2018. It was released on Friday. In the middle left in the first image is a white oval, which is an anticyclone, NASA calls N5 -AWO. An anticyclone is a "large-scale circulation of winds around a central region of high atmospheric pressure ," says the National Weather Service. Another giant anticyclone, known as the Little Red Spot, is near the second and third images. It is the size of the earth and should not be confused with the older and much bigger Big Red Spot. A reddish-orange band in the fourth and fifth pictures is the North North Temperate Belt. Download members of the public, improve, process and share their photographs on Juno's photos. This image was created by Gerald Eichstädt and Seán Doran. The spacecraft Juno was launched on 5 August 2011. She entered Jupiter's orbit on July 4, 2016, and her mission is expected to continue through July 2021. Jupiter's Great Red Spot trapped between two jet streams is an anticyclone swirling around a center at high atmospheric pressure and in the opposite sense of hurricanes on the earth turns. It's much bigger than the Little Red Spot. The most important journalistic mission of the Weather Society is to report on the breaking weather, the environment and the importance of science for our lives. This story does not necessarily represent the position of our parent company IBM.